If you are launching a new start up, or launching a new sales team, you probably don’t have much in the way of metrics. You probably don’t have any historical data. This means that you most likely can’t draw any conclusions that are statistically significant. It will be extremely tempting to draw conclusions. Don’t. You will see in the data trends that your business is wildly successful, and you’ll want to make decisions based on that, but you must resist the temptation and gather more data. It takes time. Another big misconception about data is that it’s easily gathered and easily retrieved. Building fast growing companies or sales teams is always messy. The data will be everywhere, and it’s going to be a huge pain to gather it into one place. Things won’t add up, and it’ll take even more time to normalize. Yes, this is completely normal. Companies that have been around for years might have all the numbers, but you’re not there yet. In the short term, don’t give up, it’s worth the effort once you have enough data to draw insights. I don’t mean this literally, because it’s impossible (see the previous point). But in the beginning when you don’t know what works, you’re probably going to have to cast a wider net and measure more numbers than will ultimately be useful in the long run. Keeping in mind that it will be work to gather the data, what I recommend is coming up with a list of the metrics you can retrieve reasonably. For example, at a previous company we measured number of deals sold in a month, the average revenue per deal, calls, pitches, structure of the deal, type of deal, etc. etc. In the end we narrowed it down to a number called Net Revenue Per Email, which ended up being a better measure of performance than all of the numbers combined. But it took us time looking at all of these numbers to figure out which numbers really drove results. Or worse, they won’t say anything. Every time I see a new manager look at the numbers for the first time, they seem shocked when they don’t see any clear trends in the numbers. The real world is messy; you won’t always see obvious trends. Sometimes, the two numbers you are comparing just don’t share any relationship. Sometimes, you’re looking at the wrong numbers. Sometimes, the numbers were based on bad data, or maybe the team was logging things incorrectly. First, accept that as a sales leader, there’s no way you’re going to be able to keep tabs on everything that’s happening on your team. Adding metrics into the equation, you’ll get some insight to whats going on, call it an additional 20-30% visibility. Metrics can not and will not give you 100% visibility into how you should be driving your team. There are externalities you are not measuring, some of your numbers are wrong, etc. 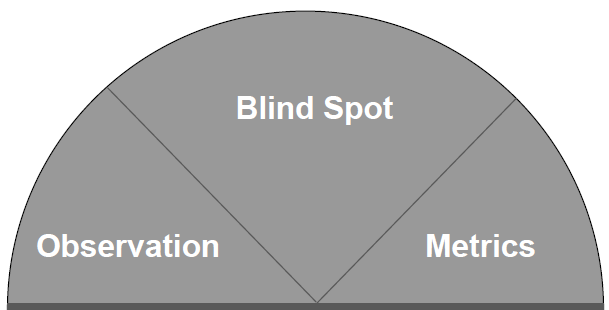 Now that we realize that we can’t see everything, and metrics only get us an additional 20-30%, this makes the case for spending time on the floor observing and talking to the team. A leader or manager who is close to his/her team will be able to get additional insight into what’s working and not working. Combined, observation and metrics will give you the most complete picture. Once you’ve started tracking metrics, you’ll soon come to realize that some of those numbers don’t matter. I tend to split numbers into to major groups: vanity metrics and actionable metrics. The vanity metrics are ones that might sound impressive, but ultimately don’t uncover any insight that could be used to make improvements on the team’s performance. Examples of this might be sharing total number of sign-ups without sharing the conversion rate to paying. One number is useless without the other, but might look impressive. Actionable metrics are the holy grail. These are the numbers that tell you and your managers what to do. You have to be looking at the right number, over the right amount of time. When you have this number, you see it drop, and you know its important, you’ll know what action to take to make it go back up. These are the only numbers that matter. How can some numbers not be all that important? Well, it may come down to needing more information. Some numbers, on their own, may not matter unless you can see the relationship between that number and other numbers you are tracking. I’d recommend reading Cracking the Sales Management Code: The Secrets to Measuring and Managing Sales Performance. It goes into much great detail on the subject, but it basically breaks all metrics down into Sales Activities, Sales Objectives, and Business Results. Using this framework you can then start to see how each category relates to the other, and how one number might be driving other numbers up or down. Building the sales machine will require that you understand these relationships. Take the time to figure them out.